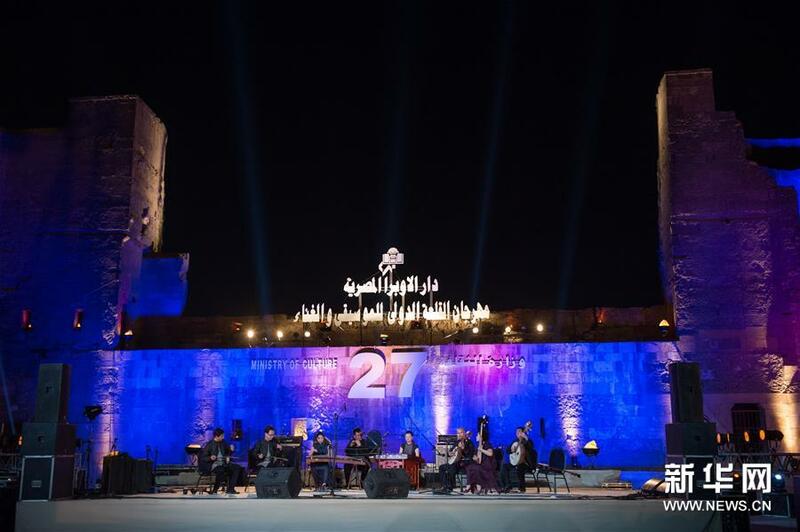 Cairo's renowned Saladin Citadel was packed with Egyptian audience on Monday for a folk music concert held by the Forbidden City Chamber Orchestra of the Chinese Conservatory of Music. The 60-minute concert was part of the 27th edition of Cairo Opera House's annual Citadel Music Festival, which is gathering local and international performances covering all genres. The two-week festival, running until Aug. 17, includes 37 concerts from six Arab and foreign countries, including China, Palestine, Syria, Tunisia, Mexico and Panama. The thrilled audience eagerly stood to watch the Chinese artists performing numerous musical pieces. Amid joyful atmosphere of a moonlit breezy night, the cheerful Chinese music show has captivated the minds and hearts of the audience as the orchestra played festive and famed Chinese folk melodies. Reacting to the music, Ola Hussein, a physician, said it is her first time to watch a live Chinese musical show. "I really love the music, and I feel it is very close to the Egyptian music," said Hussein, who came to the concert with her friends. The young lady said she is addicted to the music, adding that she will start following Chinese music as it "charmed her." Hussein's friend, Aya Mohammed, said the pieces played by the orchestra sounded amazing and were flamboyantly ear-catching with the melodies. "The music was kind of a collection of the finest nature sounds. I can listen to such melodies for relaxation," Mohammed told Xinhua. Also a physician, said such performances can help people in Egypt get some knowledge about the Chinese culture. Through such cultural moves, both countries want to boost friendly ties and enhance mutual understandings and future development. "We have participated in a series of cultural exchange performances in Egypt, including a Chinese music class and an indoor concert held at the Chinese Cultural Center in Cairo," said Shen Cheng, professor of the China Conservatory of Music, who is in charge of the Forbidden City Chamber Orchestra. Shen said Egypt is a country along the routes involved in the Belt and Road Initiative and has a splendid ancient civilization, adding "it is an honor" to be part of the cultural exchanges to promote the traditional friendship between China and Egypt. "The warm response from audience is the best proof of the charm of Chinese folk music and the friendship between the two peoples. We hope more Egyptians will get to know and love China and Chinese culture through this cultural exchange," he explained. Zhang Zunlian, another professor of the China Conservatory of Music, said China and Egypt bear ancient civilizations in the world, both with splendid, long-standing history and culture. "Music is borderless and this in-depth exchange and cooperation with Egyptian musicians has strengthened the contact and mutual learning of the traditional music between the two countries," the professor said. Zhang said the elegance of Chinese music and the passion of Egyptian music have their unique charm, adding that the better connectivity will promote the blending and complementarities of music among different countries and nations. "As Chinese music goes out more often with better promotion, I believe it will become an important part of world's music culture and will facilitate better understanding of Egyptian and Chinese culture," he added.